Suitable for printing non-deforming flat substrates in film, sheet and board forms. 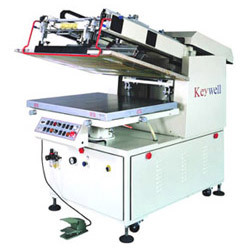 Motor-driven transmission / squeegee and flood coater are adjustable with different speeds/ printing stroke free setting / pneumatic printing head lifting / adjustable squeegee angle / synchronously peel off / honey comb printing table / table surface with hard chrome / Table with XY axis micro adjustment / printing head stops at either front or rear / PLC control. 1. Model: KY-690. 2. Table size (mm): 800 x 1000mm. 3. Max. printing size(mm): 600 x 900mm. 4. Max. frame size(mm): 900 x 1200mm. 5. Effective thickness of substrate: 0~50mm. 6. Printing speed: 800 time / hour. 7. Power: 220/380/415V. 3 Phase. 60/50HZ. 8. Machine dimension: W1000 x D1800 x H1380mm. 9. Machine weight: 650kgs.